NWA 482 uncut 1015g mass. 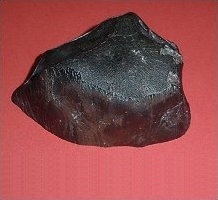 A 1015 g stone was purchased on 2001 January 10 in Alnif, Morocco, by Michael Farmer. The exact location of find is unknown but it is possibly in Algeria. The stone is complete, oriented, and appears relatively unweathered. 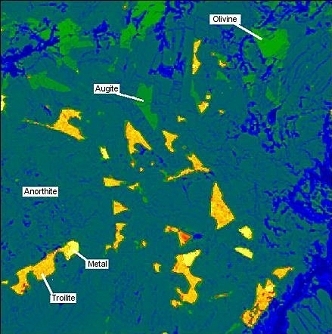 Classification and mineralogy (A. Rubin and P. Warren, UCLA; D. Kring and I. Daubar, UAz): texture is typical of a crystalline impact melt breccia (polymict) with highland affinities; glassy and vesicular melt veins and melt pockets indicate shock subsequent to compaction by an impact event; plagioclase, An95.7Ab4.09Or0.17 (n = 136, UAz); olivine, Fo65� (average Fo66) with FeO/MnO = 88 ± 7 g/g (UCLA); olivine Fo68.4 with FeO/MnO = 93.9 ± 7.7 g/g (range: 78.7 to 111) (n = 51, UAz); pyroxene, Fs25Wo17 with nearly uniform Mg/(Mg + Fe) = 67� mol% and FeO/MnO = 51 ± 6 g/g (n = 10, UCLA); pyroxene, Wo10.3�En32.6�.9 Fs42.6�.2, mean Mg/(Mg + Fe) = 68 mol%, FeO/MnO = 52 ± 8 g/g (n = 28, UAz); glassy melt veins occur in both UCLA and UAz samples; a 0.1 mm vein (UCLA) has SiO2 = 44.3 wt%, Na2O = 0.3 wt%, Al2O3 = 30.0 wt%, FeO = 3.6 wt%, MgO = 3.9 wt%, CaO = 17.3 wt%, and TiO2 = 0.3 wt%, which may approximate the bulk meteorite composition. Specimens: half of the main mass is with Hupé; 74 g, DPitt; type specimens, 24 g, UCLA, and 18 g, UAz. 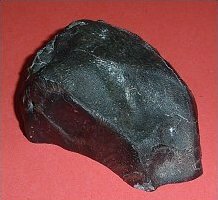 Takeda H., Yamaguchi A., Otsuki M., Hiroi T., Ohtake M., and Kato M.
basis of some feldspathic lunar meteorites (abstract). 73th Annual Meeting of the Meteoritical Society, abstract no. 5060. (2010) Density, porosity and magnetic susceptibility of lunar rocks (abstract). 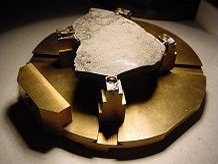 (2008) Keeping up with the lunar meteorites � 2008 (abstract). Puchtel I. S., Walker R. J., James O. B., and Kring D. A. Implications for the late accretion history of the Moon and Earth. Geochimica et Cosmochimica Acta 72, 3022�42. 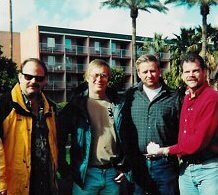 Puchtel I.S., Walker R.J., Kring D.A., and James O.B. systematics of lunar impact melt rocks (abstract). In Lunar and Planetary Science XXXVIII, abstract no. 2040, 38th Lunar and Planetary Science Conference, Houston. Warren P. H., Ulff-M鴏ler F., and Kallemeyn G. W.
heterogeneities of the upper lunar crust. Meteoritics &.Planetary Science 40, 989�14. 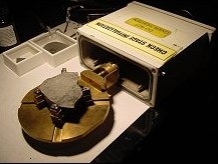 (2005) Lunar geochemistry as told by lunar meteorites. Chemie der Erde 65, 297�6. Lorenzetti S., Busemann H., and Eugster O. (2005) Regolith history of lunar meteorites. 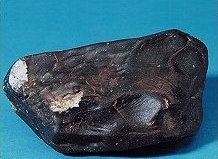 Meteoritics & Planetary Science 40, 315-327. 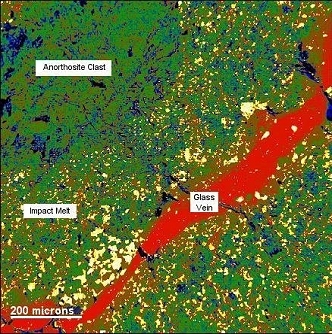 Consolmagno G. J., Russell S. S., and Jeffries T. E.
(2004) An in杝itu study of REE abundances in three anorthositic impact melt lunar highland meteorites (abstract). (2003) Exposure histories of lunar meteorites (abstract). National Institute of Polar Research, Tokyo. Daubar I. J., Kring D. A., Swindle T. D., and Jull A. J. T.
Meteoritics & Planetary Science 37, 1797-1814. 64th Annual Meeting, Meteoritical Society. Warren P. H. and Kallemeyn G. W.
Learn about the latest research on the Tagish Lake meteorite that fell in the Yukon last year, and new meteorites from The Moon and Mars found recently in Northwest Africa. Two evening lectures will be given by current and former NASA scientists in Room 64, Johnson Hall on the University of Washington main campus, and a special Saturday meteorite viewing session will be held in Room 401, Johnson Hall. 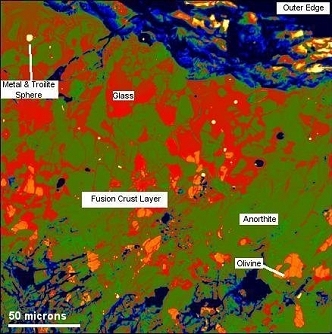 Thursday, April 12, 6:30-8:00 pm Dr. Michael Zolensky, NASA Johnson Space Center, Houston "The Fall, Collection and Study of the Tagish Lake Carbonaceous Chondrite Meteorite, and Its Unique Organic Compounds"
Saturday, April 14, Noon-3:00 pm Meteorite viewing session. Come and see the latest and second largest known lunar meteorite, and also use petrographic microscopes to examine for yourself a variety of other spectacular meteorites from the Asteroid Belt and from Mars. September, 2001 Dr. K. Nishiizumi and M. W. Caffee, Space Sciences Laboratory. Results: A document produced for the 64th annual Meteoritical Society Meeting document number 5411 briefly described the following: NWA 482: the AL26 activity in the exterior sample of NWA 482 is up to 40% higher than that of the interior sample. This excess AL26 is produced by SCR during it 4PI exposure to cosmic rays. The pre-atmospheric radius is estimated at 5.5-7 cm based on a recovered mass of 1015 g and 1-1.5 cm of ablation. The BE10 exposure age is 0.9+/- 0.2 Myr. The saturation values of SCR produced AL26 are 10-25 dpm for the interior sample (1 cm from the crust) and 20-40 dpm for the exterior sample respectively. The latter value is similar to the SCR production rate of AL26 at a depth of ~1.5-2 cm in an object having a radius of 6-7 cm. The CI36 terrestrial age is 60-120 kyr. September, 2001 Dr. Paul H. Warren and Dr. Gregory W. Kallemeyn, Institute of Geophysics. Results:A document produced for the 64th annual Meteoritical Society Meeting document number 5453 briefly described the following: Cosmic ray exposure evidence confirms NWA 482 is not paired (even in the source-crater/launch sense) with any other lunar meteorite. It has a density of ~2.54 g/cm3 and a porosity of roughly 13%. It is defined as being KREEP-poor which indicates it came from an area of the moon not previously sampled by the Apollo or Luna missions. Everything else in the report reaffirmed what is already known. 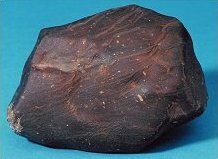 History: Sample NWA 482 was a 1015 g stone with complete fusion crust recovered in Northwest Africa in late 2000. Samples Studied: Four part slices and one complete slice provided by Adam and Greg Hupé, who also own the main mass from one end of the meteorite. Methods: The slices were polished on one side, carbon coated and analyzed by electron microprobe energy-dispersive X-ray analysis. Back-scattered electron images were obtained of each entire slice and of other areas of interest. Results: This sample contains sparse white clasts of anorthosite in a dominant matrix composed of a complex intergrowth of anorthite, pigeonite, olivine, augite, troilite, Fe-Ni metal, Ti-rich chromite, ilmenite and rare whitlockite and a Zr-bearing titanate mineral. These two lithologies have been subsequently brecciated and injected by veinlets of glass, and the entire sample is coated by a thin glassy fusion crust. 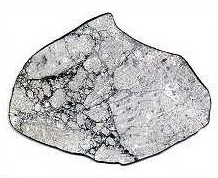 The dominant portion of the sample is interpreted as a crystallized impact melt derived from a pre-existing anorthositic lithology composed mainly of anorthite with subordinate ferromagnesian silicates. Metal and troilite in this portion commonly occur as small spherical grains, suggesting that they had been molten, and the silicates are intergrown in a variable, "eutectoid" texture. No grains of zircon were found in the sample despite a diligent search. Interpretation: NWA 482 is a very fresh sample of ferroan anorthosite from the ancient lunar highlands crust. 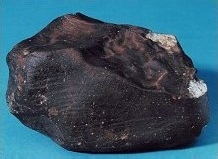 By analogy with Apollo 16 samples such as 60025, parts of this sample are probably 4.4 to 4.5 billion years old. The original rock has been extensively remelted, presumably by a large impact on the lunar crust more than 4 billion years ago. The extent to which any of the impacting bolide was admixed with the original rock is unknown. 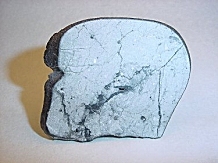 At a much later time (probably several tens to hundreds of millions of years ago), the sample was ejected from the Moon by another impact that caused brecciation and injection of melt veinlets which rapidly cooled to glass. 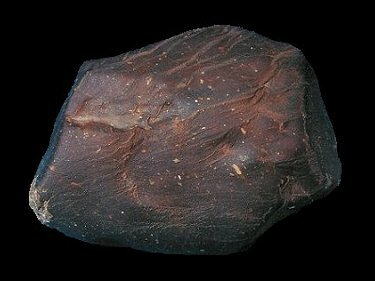 After extensive travel in space, the stone fell in Northwest Africa very recently, probably within the last thousand years judging from the freshness of the fusion crust. Reference: Papike, J.J., Ryder, G. and Shearer, C.K. (1998) Lunar samples. In Planetary Materials, editied by J.J. Papike, Reviews of Mineralogy, vol. 36, pp. 5-1 to 5-234. Mineralogical Society of America, Washington, D.C.
February 13th, 2001 Dr. David A. Kring performed extensive microprobe analysis. Results: Recommended sample to be classified as a lunar impact melt (polymict, crystalline) breccia. February 10th, 2001 Dr. Jeffrey Grossman, of the Nomenclature Committee, analyzed data provided by the universities and Mike Farmer. Results: Serial number NWA 482 and official weight of 1015 grams was assigned to the meteorite. 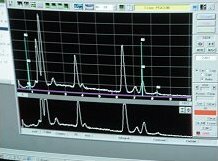 February 3rd, 2001 Dr. Robert Clayton to perform oxygen isotope analysis. February 2nd, 2001 Dr. Alan Rubin studied material under a Scanning Electron Microscope with microprobe analyzer. Results: The rock was described as a lunar impact melt. Its plagioclase is An96-97. It has shock veins. The pyroxene is pigeonite with an mg-number of about 70; the olivine is about Fo66. Material was then forwarded to Dr. Robert Clayton of the University of Chicago for oxygen isotope analysis. 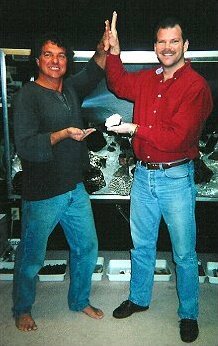 February 1st, 2001 Dr. David A. Kring performed a thin section petrologic study. Results: It is clearly anorthositic, with pyroxene scattered through it. So, petrographically, it appears lunar. January 23rd 2001 Universities were both provided samples and agreed to publish results in cooperation. Results: They determined a lunar origin for this material. 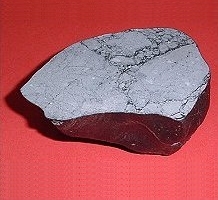 Complete polished slice of NWA 482, displaying shock veins. 30.9 gram whole slice of NWA 482 displaying brecciation. 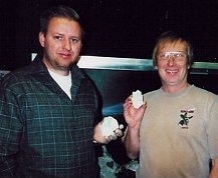 Mike Farmer (left) and Jim Strope holding slices of NWA 482. 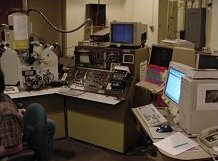 The electron microprobe laboratory where many unique meteorites are confirmed - University of Washington. 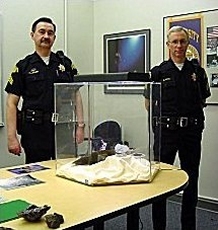 From left to right, Adam Hupé, Jim Strope, Mike Farmer and Greg Hupé holding NWA 482. 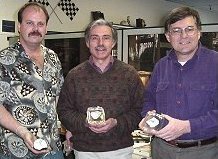 Greg Hupé (left) holding NWA 482 main mass, Robert Haag (right) holding Calcalong Creek main mass and Mike Farmer (middle). The meeting of the masses, a first! Calcalong Creek (left) and NWA 482. 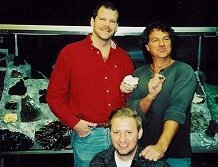 Adam Hupé (left), Dr. Anthony Irving and Dr. Donald Brownlee holding slices of NWA 482. X-ray energy spectrum of NWA 482 from microprobe analysis - University of Washington. Part slice mounted in instrument stage prior to electron microprobe analysis - University of Washington. View 1. Part slice mounted in instrument stage prior to electron microprobe analysis - University of Washington. View 2. 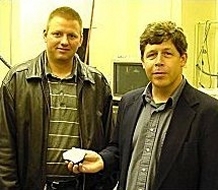 Mike Farmer (left) and Dr. Michael Zolensky holding NWA 482 main mass. Armed security with NWA 482. 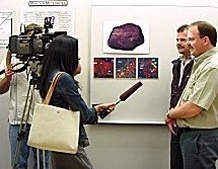 Adam Hupé (foreground) and Greg Hupé being interviewed by the local media  Spring Lecture Series, University of Washington. Greg Hupé displaying the NWA 482 main mass for filming during the Spring Lecture Series, University of Washington. 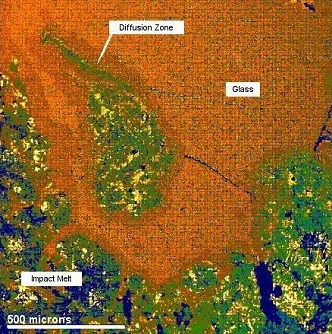 False color, back scattered electron image of impact melt matrix. False color, back scattered electron image of fusion crust. False color, back scattered electron image from electron microprobe analysis. Robert Haag (left), holding Calcalong Creek and Greg Hupé, holding NWA 482 main masses.